To kickstart its Gamescom 2017 coverage Nintendo has detailed some upcoming free content coming to Splatoon 2. If you're a fan of Turf War and Ranked Battle then you'll be pleased to learn that Manta Maria joins the roster soon. That's not all, however; the Bubble Blower special weapon – available in a set with the Forge Splattershot Pro – is also on its way. This update arrives on Saturday 2nd September. If you can't wait until then, you'll be pleased to know that a new Salmon Run stage - Lost Outpost - will be available tomorrow. I cannot wait for the Manta Maria map. I can just tell it's going to be my favourite and the name is brilliant! Great that Splatoon 2 keeps getting Fresh content. Loving the bubbles idea, can't wait to see how they play. The Manta Maria looks great as does the new salmon run area (My favourite part of Splatoon 2). Just a heads up: I think the SNES Classic is up on Amazon US. Search SNES Classic. The listing is sketchy but it ships from and is sold by Amazon. Superb! I'll be clocking in for a shift at Grizzco's the minute it opens tomorrow. Can't wait! Oh boy. I might finally return to this game after 3 weeks of hiatus. 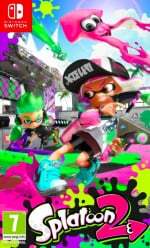 I just love their presentation for splatoon. These updates will be very welcomed, and all look really interesting. The new ship stage especially looks slightly more ambitious in design than some of the earlier ones (which I all think are solid, and subtlety improved over the original's stages in a number of ways). Looking forward to the drop. Also, are there any UK players out there who want to have a go at entering the UK Grand Final Championship thing at EGX? I'm desperately looking for a partner! I've got SSS+ across the Ranked modes, but am hoping to get that improved by the 30th. Please let me know! Sweet, a new stage right before a Splatfest! Completely forgot about that bubble special, too. Looking forward to that Splattershot Pro. Just began using it and loving it thus far. So far, S2 is getting new stages slower than S1. Perhaps it is to make up for S2 having 8 stages at launch, while S1 had 5, so that new stages will be added to S2 for as long as S1? Looking forward to those new stages! Sturgeon Shipyard is my favorite map so far, but I have a feeling that I'll like Manta Maria quite a bit. The ship stages are very interesting for some reason!!! @Maxz Hi, I would be interested! I am not that highly ranked, mainly because I have played more salmon run and turf war. I am level 27 and A-, B, A. I am profreshional in Salmon Run. Happy to try league mode or so to check if we match?! Let me know! Ship stage looks all sort of awesome, but I'm a bit disappointed that the new Salmon Run area looks a lot like Marooner's Bay. Let's see how they stack up in practice. New stages are way overdue. Glad this is finally happening. Duuuuuude. Outpost looks like it will be having a lot of people down rank from profreshinal! Map looks sick though. Salmon Run is so addicting! New ship stage looks nice. It's about time we got a new one. @silentium Thanks for getting in contact! I re-checked the original announcement post, and saw your comment under it, so I was thinking about tagging you. I'm currently away from my Switch, but should be re-united within the next 2-3 days. I'd love to give League Battle a try. Am I the only one who couldn't resist doing the "2" hand gesture whenever he did it? Splatoon is the gift that keeps on giving! @Maxz I will add you tonight after work. My user name is Sh0w71me. What's the best way of contacting you for a round of league battle? Can you send PM on here somehow? @silentium That's a very good question. Unfortunately there's no PM function on the website. I'm not sure why, maybe it makes modding and keeping an eye on harassment easier if everything's out in the open. What we generally use this thread as a workaround. People post anything to do with organising matches there, so it doesn't clog the other forum topics. Feel free to tag me in there and we should be able to get a match going. There's also Nintendo's official online app, which might be with giving a go. If you're free tonight, I'm back with my Switch and ready to splat!